We're in an oatmeal phase chez moi. Specifically we are digging quick cooking rolled oats and we like it dry and lumpy as opposed to smooth and creamy (I realize that some folks think this is nuts.) I use just enough water to cover the oats, stir twice and it cooks in minutes. I'm so happy about this phase because making just one breakfast makes mornings a tad easier. Everyone eats the same thing with minor differences: My husband and I like it with cinnamon and nutmeg, my daughter likes it with a splash of agave and fresh apple slices; my son likes it with a dash of cinnamon and 1/2 teaspoon of maple syrup and fruit on the side. He gets particularly excited to pour his own cinnamon. It's heart health month and according to health magazine, oatmeal is one of the top ten best foods for a healthy heart and is said to lower LDL cholesterol. Besides that, it's loaded omega 3 fatty acids, fiber, potassium and folate. An awesome way to start the day. This morning I went a little off the beaten path. I stirred a handful of Peeled Snacks Cinnamon Crunch into the oatmeal (after it had finished cooking) and reserved a few to adorn the top. Cinnamon Crunch is one of the three Apple Clusters snacks that Peeled Snacks describes as "diced organic apple pieces, rolled into tasty clusters for a new crunchy snack bursting with natural flavor." 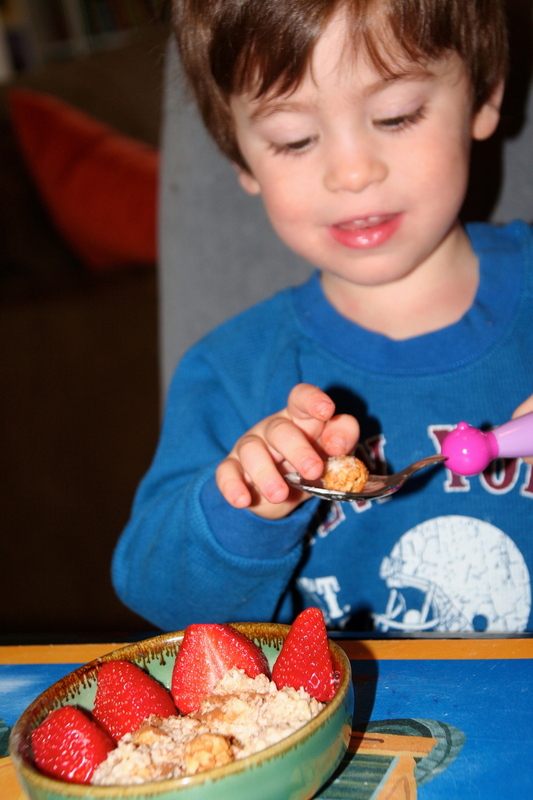 Great texture without refined sugar and a fun, non-traditional addition to our morning. My son, initially outraged that there was no maple syrup on his oatmeal, quickly became excited by this crunchy addition to his breakfast. Older PostKids Will Be Kids. And Parents Are Tired. It's Natural. Copyright 2019 LaLa Lunchbox LLC. All Rights Reserved.